Lyndon B. Johnson (LBJ) Elementary School & Tamuning Elementary School students in Guam, teachers and staff welcomed ICAP representatives once again to celebrate their 2nd year of having a Peace Project Presentation and Peace Symposium which included TED Talks from the 5th graders and sang “Imagine” by John Lennon and “Man in the Mirror” by Michael Jackson. Both schools have a regular educational approach of focusing on ‘project-based learning’. After students study a topic, they then take action in the form of project efforts to better realize and assimilate the concepts that they have learned. This year’s Peace Project themes (as represented via decorations on each grade level’s classroom door) included “Building an Arcade of Peace” (Early Programs), “A Garden of Peace” (Kindergarten), “Peace Tree” or “Ornaments of Peace” (1st grade), “Peaceful Minds” (2nd grade), “Oceans for Peace” or “Environmental Peace” (3rd grade), “Hearts of Peace” (4th grade), “Acts of Peace” (5th grade), and “Culture of Peace” (Chamorro class). Theme projects included artwork, performances, creation of peace-themed games, research of individuals who advocate peace, thoughtful consideration and commentary on peaceful actions and behaviors related to the “Choose Kind” movement (“Given the choice between being right and being kind, choose kind.”) originating from R.J. Palacio’s book Wonder, and depictions of Chamorro Latte stones bearing messages of peace in the Chamorro language. The ability of individuals to find common ground to resolve conflict. 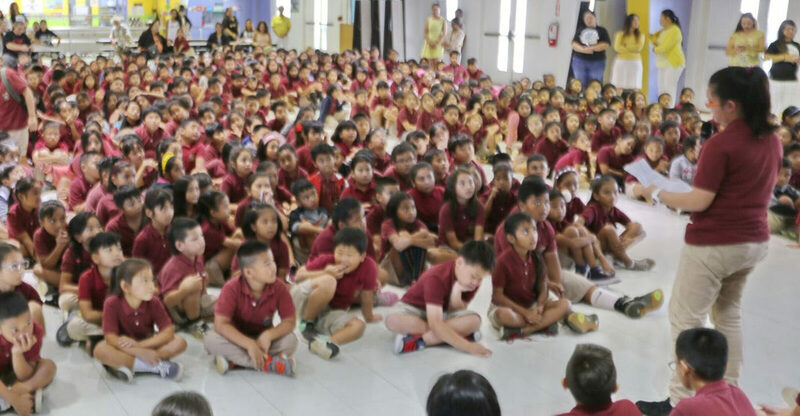 To kick off the Peace Project, LBJ & Tamuning Elementary school were able to view the “Ghandi, King, Ikeda Exhibit” that were displayed in their schools. 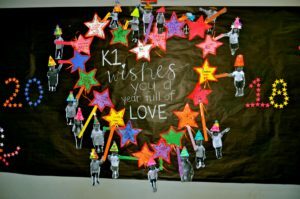 Before the students viewed the exhibit, each teacher gave the classroom a brief history of each man, Mahatma Gandhi, Martin Luther King, Jr. and Daisaku Ikeda and how they contributed to peace in the world. 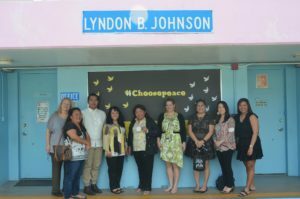 Principal Carolyn Camacho was asked if having the Peace Project for the second year had made any significant impact on the students, Camacho replied that there have been less fighting incidents in the playground and students are using their words and engaging in dialogue to communicate when they are upset. Camacho also mentioned that it is not just the students who practice peaceful acts, teachers and staff also do the same to promote a peaceful environment and lead by example. Camacho also commented that having the TED Talks inspires the younger students to look forward to participating in their own TED Talks when they become fifth graders.